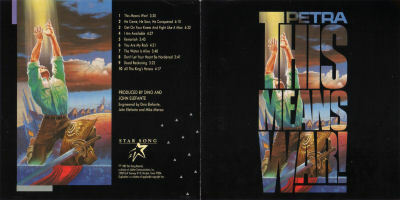 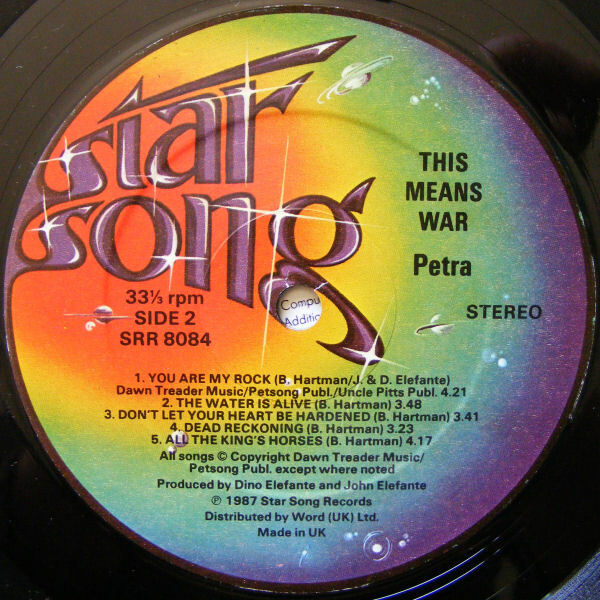 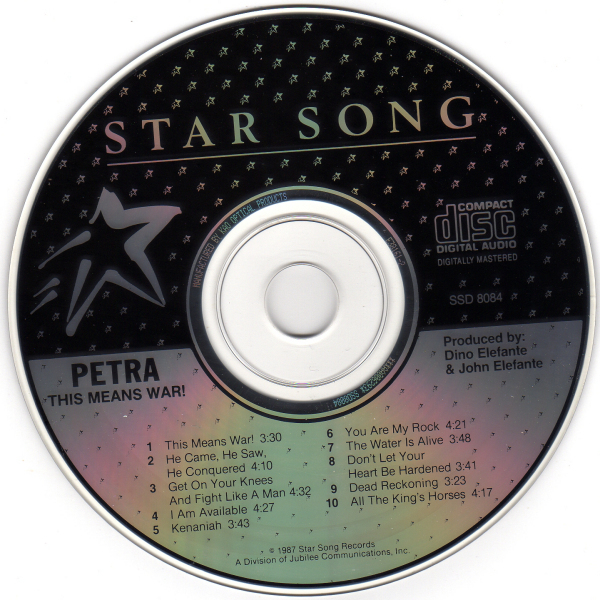 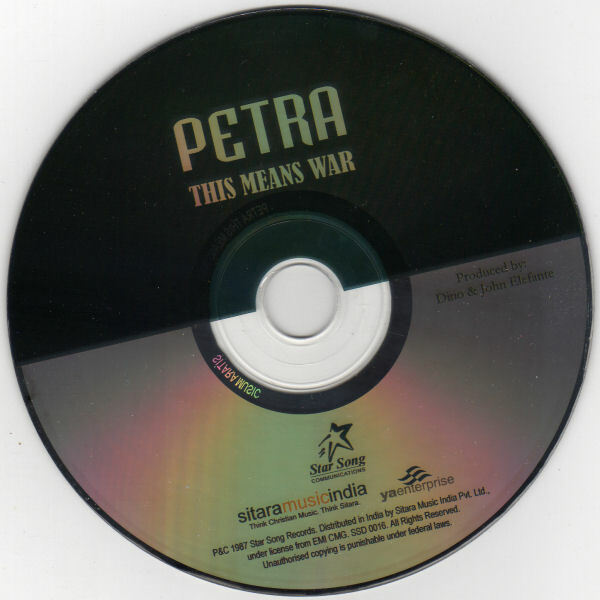 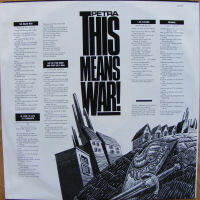 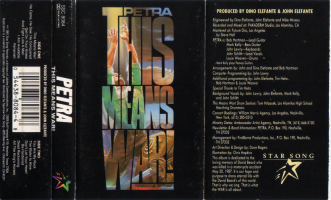 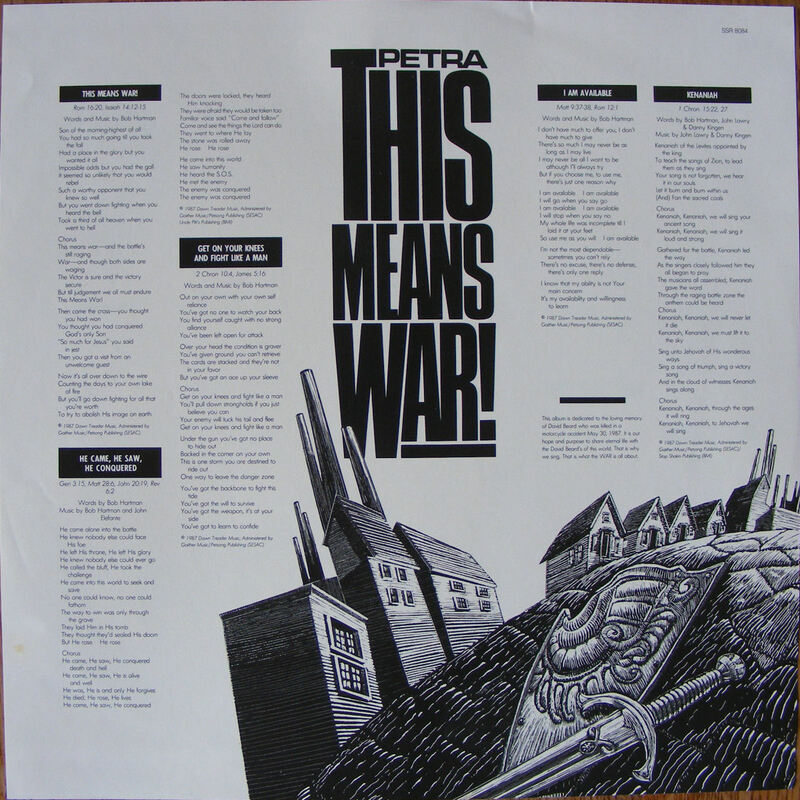 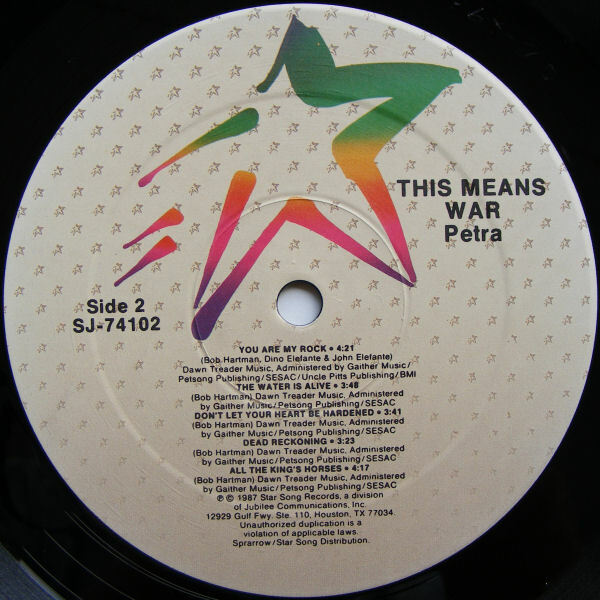 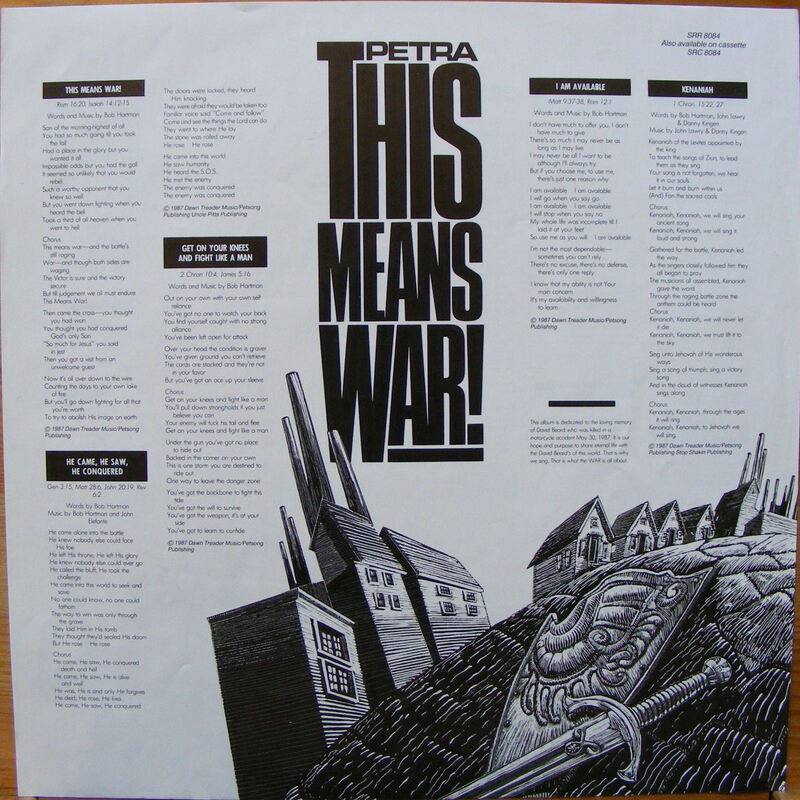 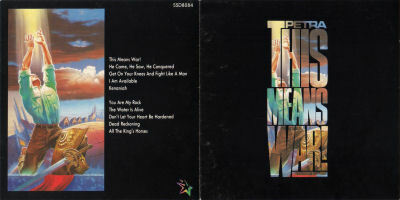 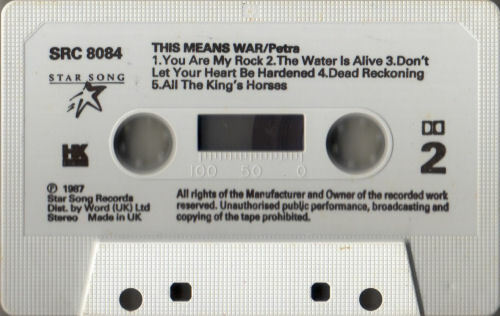 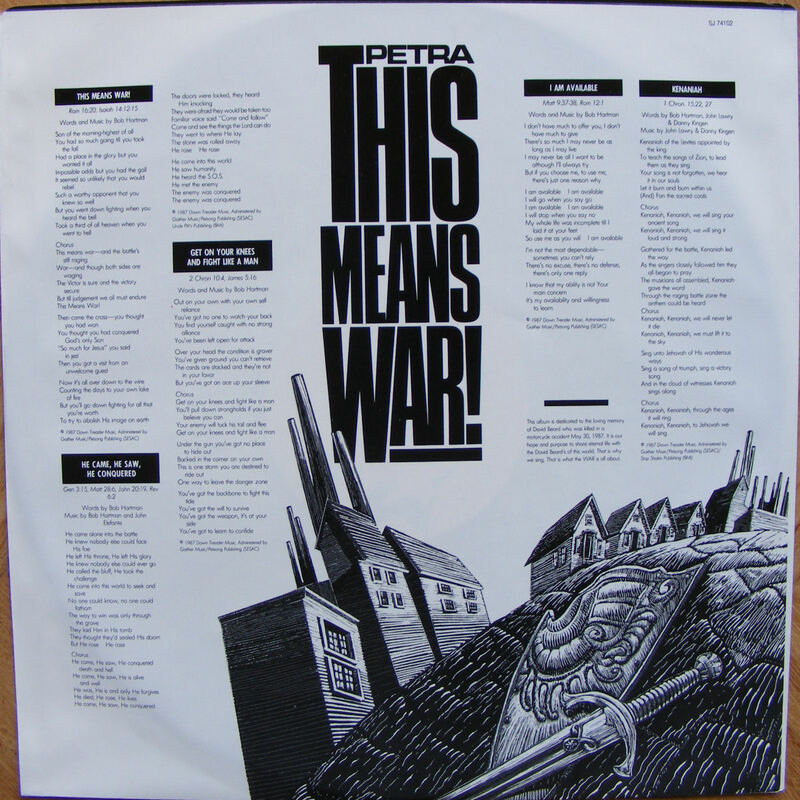 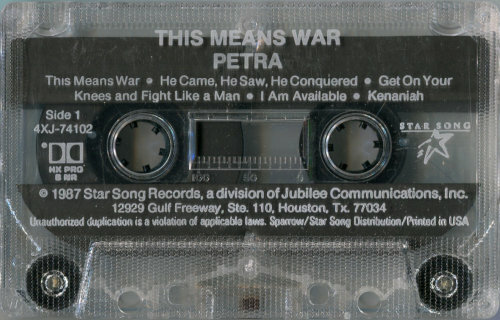 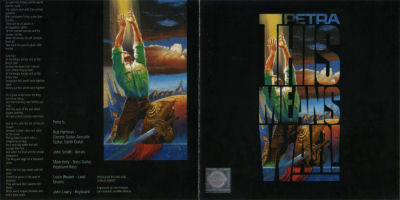 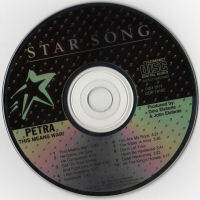 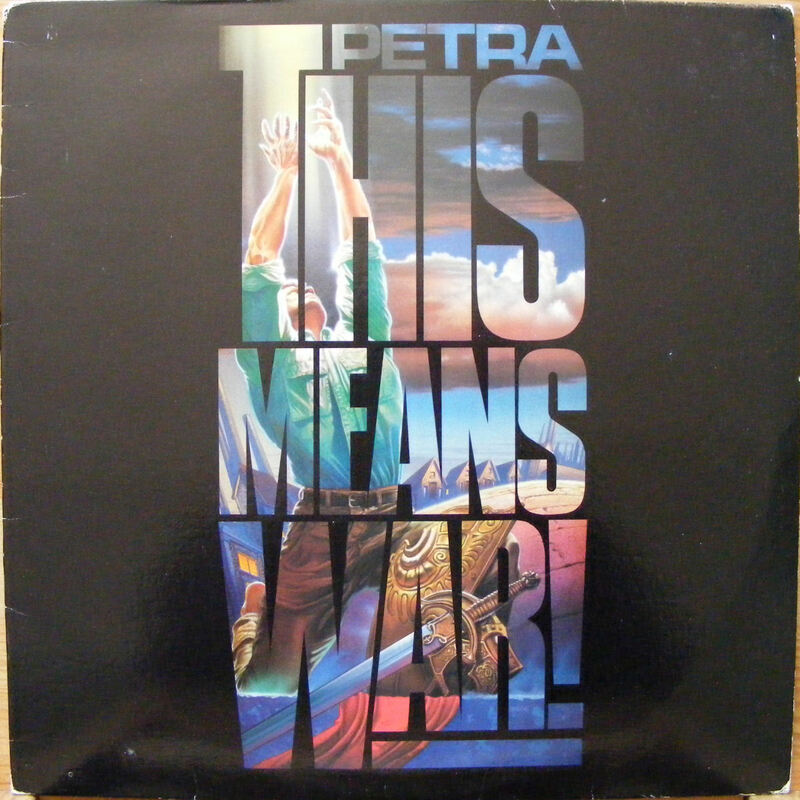 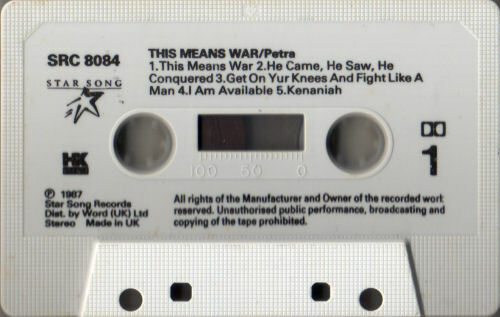 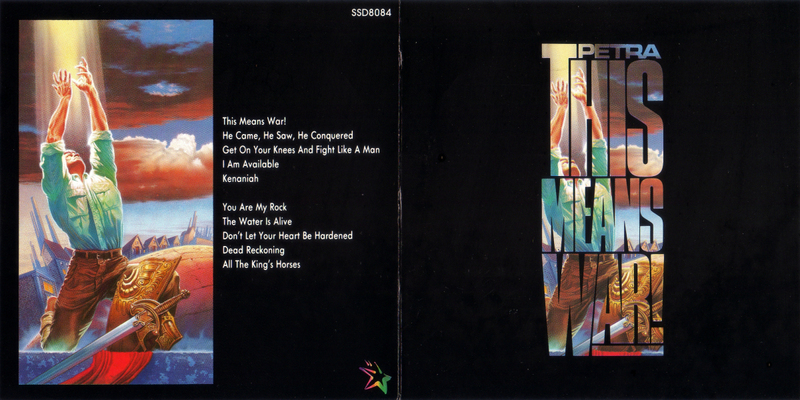 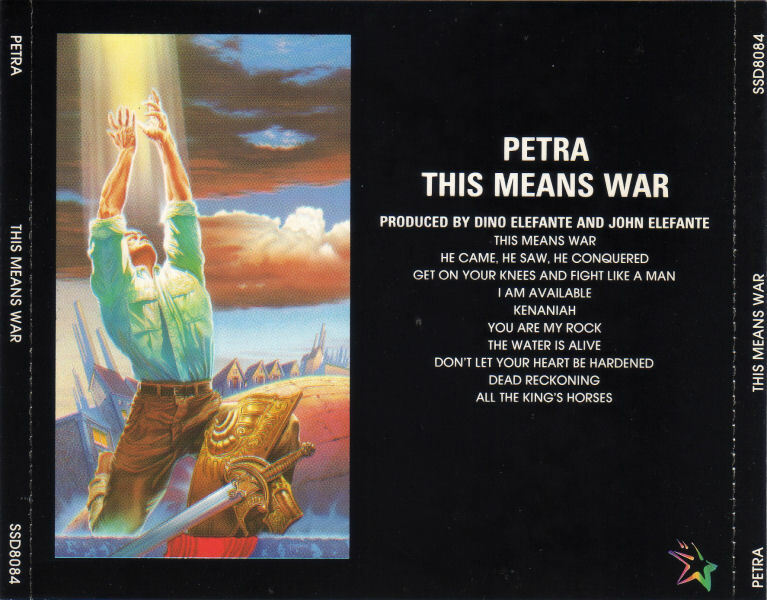 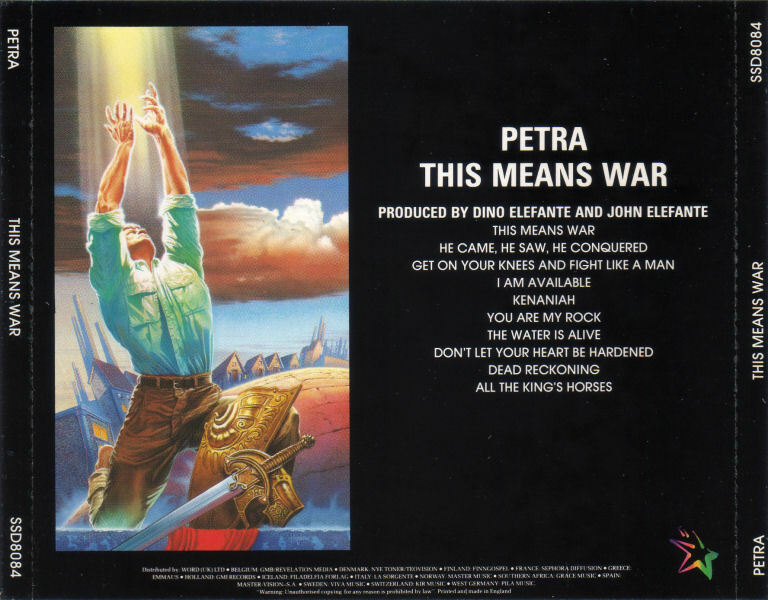 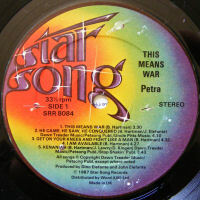 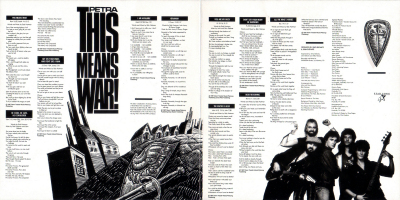 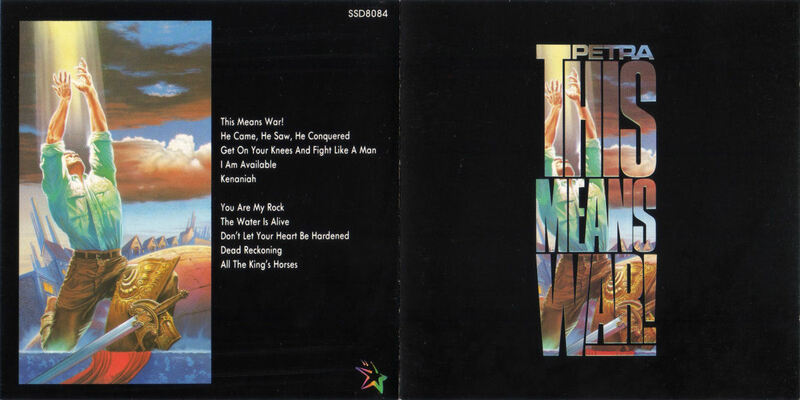 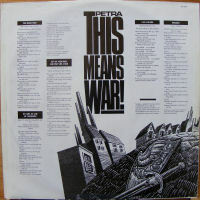 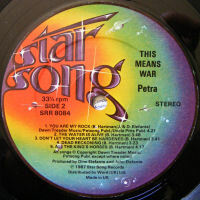 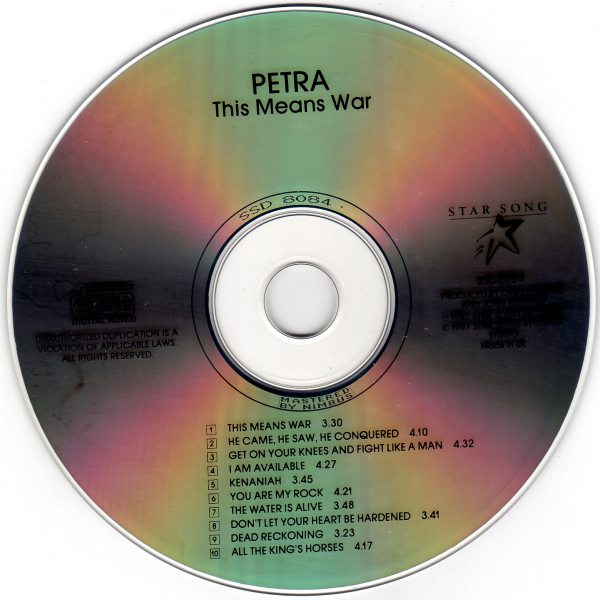  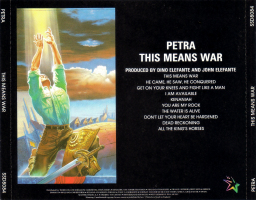 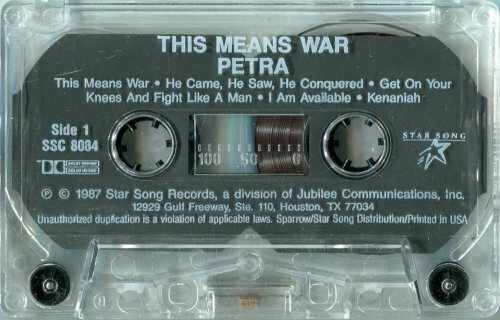 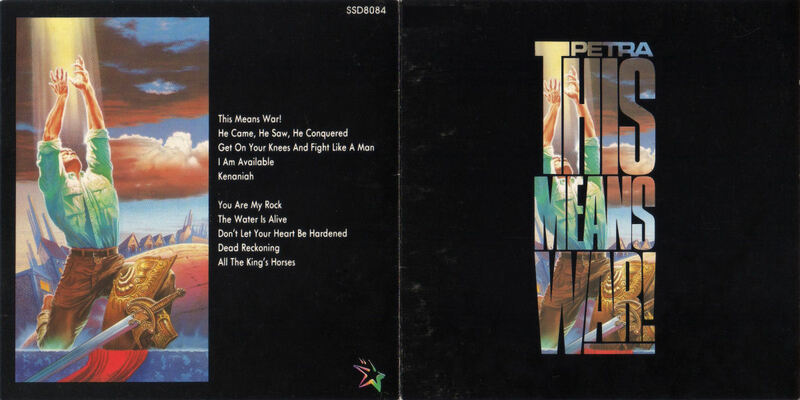 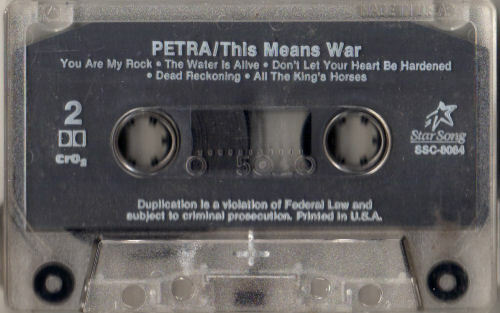 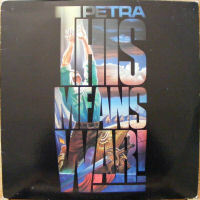 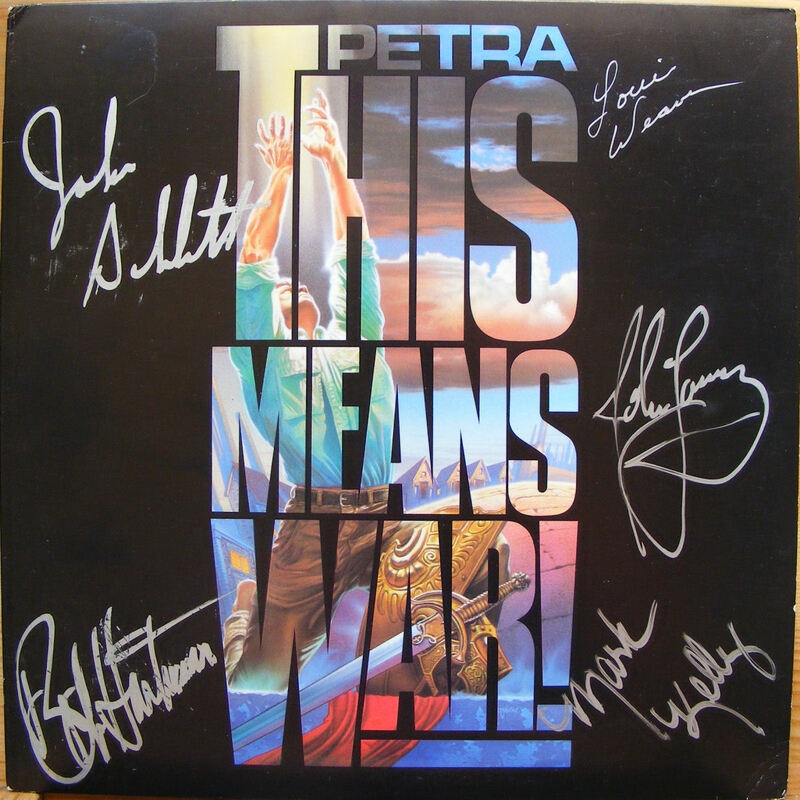 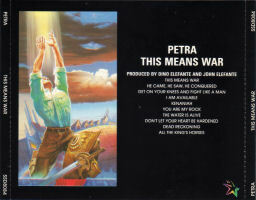 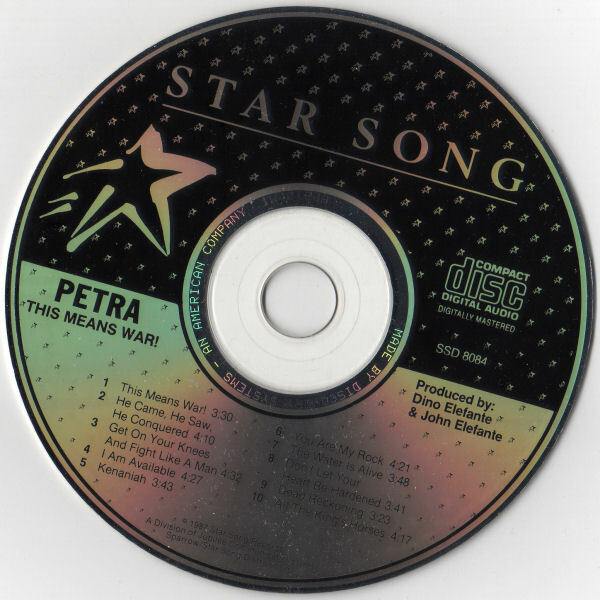 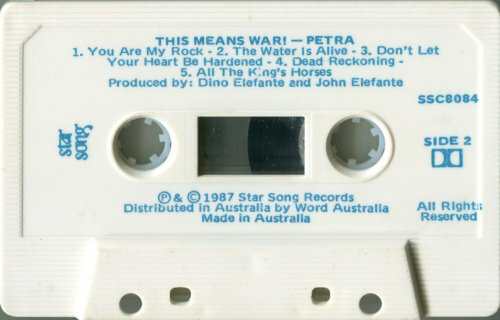 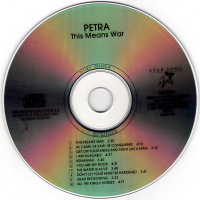 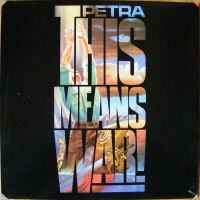 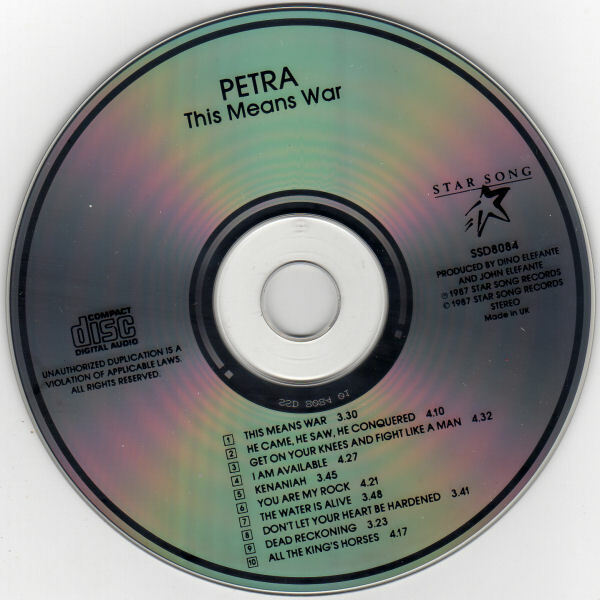 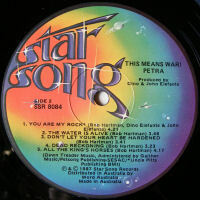 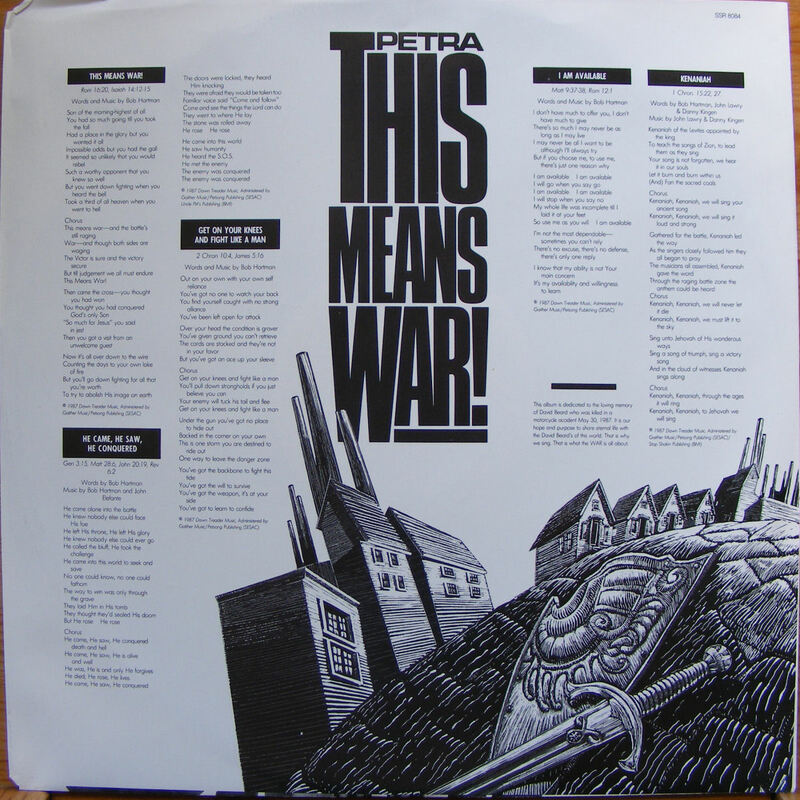 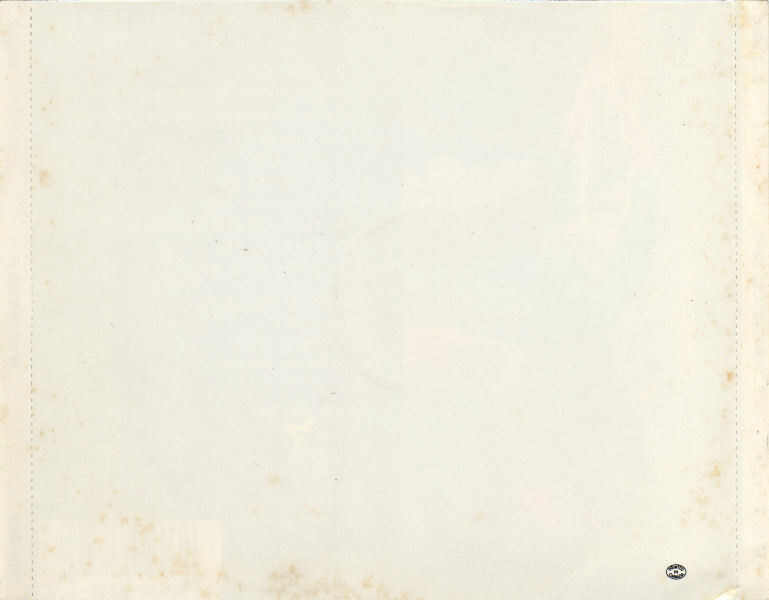 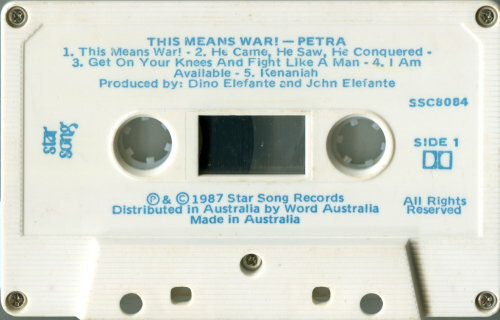 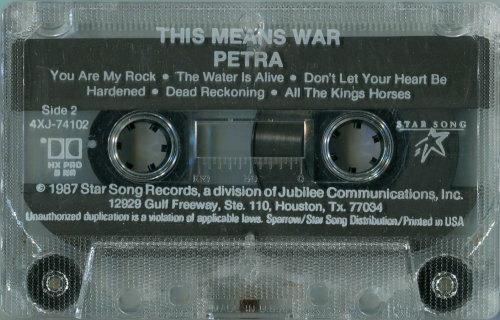 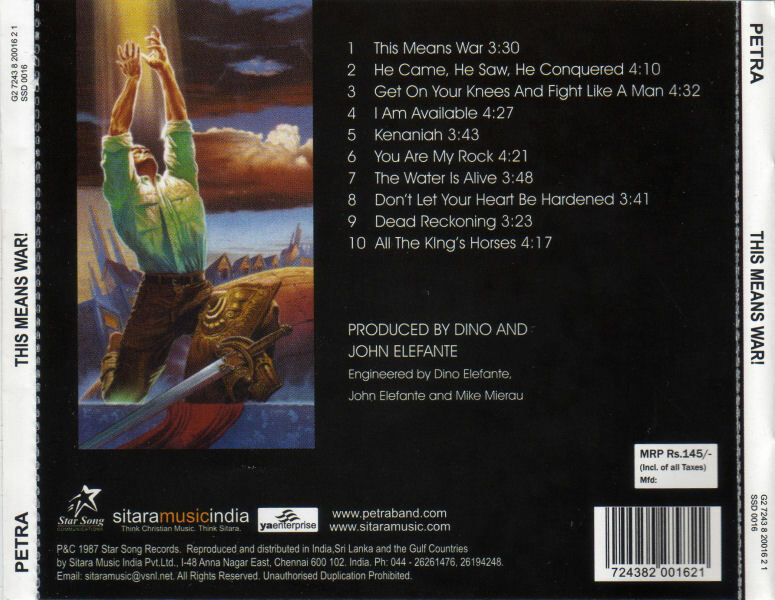 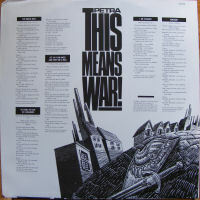 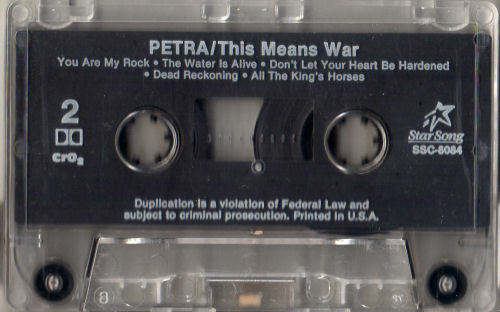 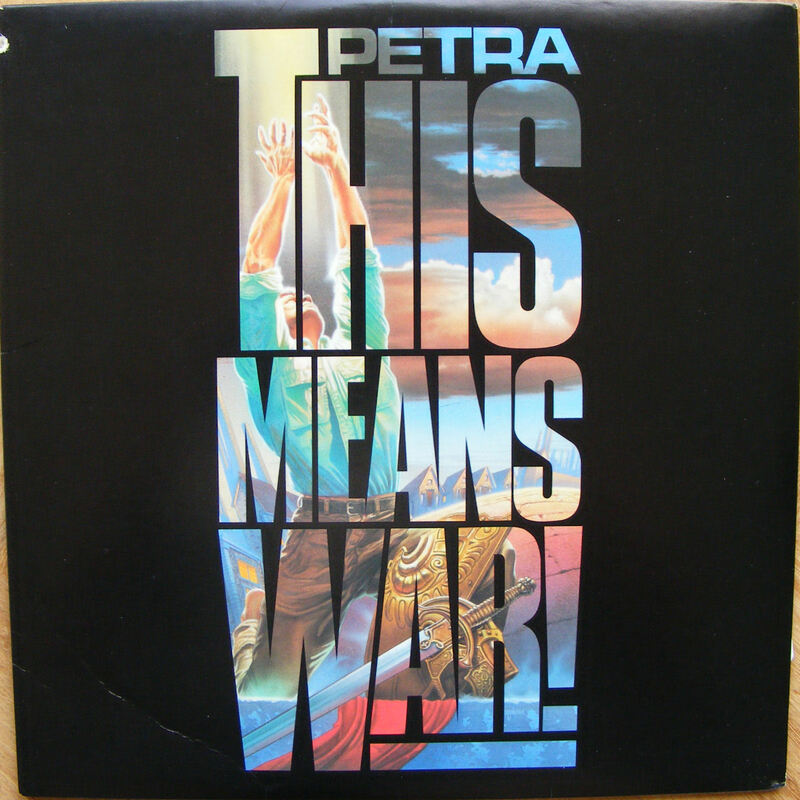 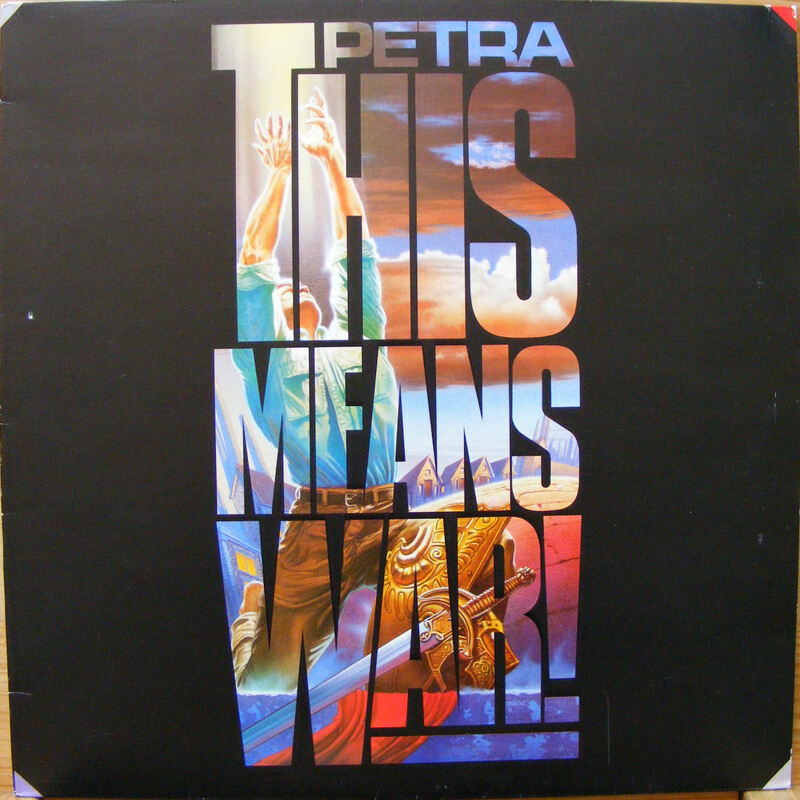 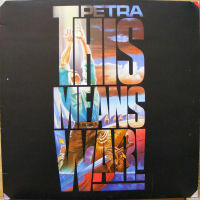 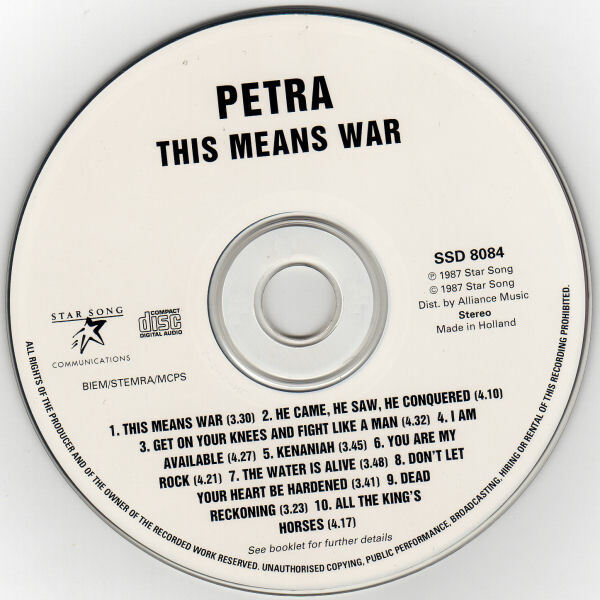 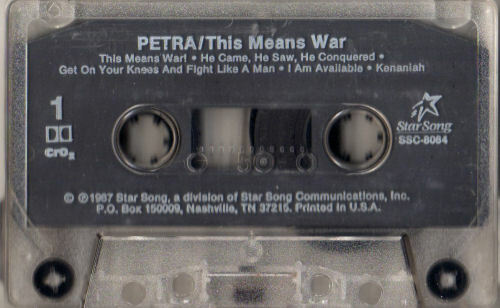 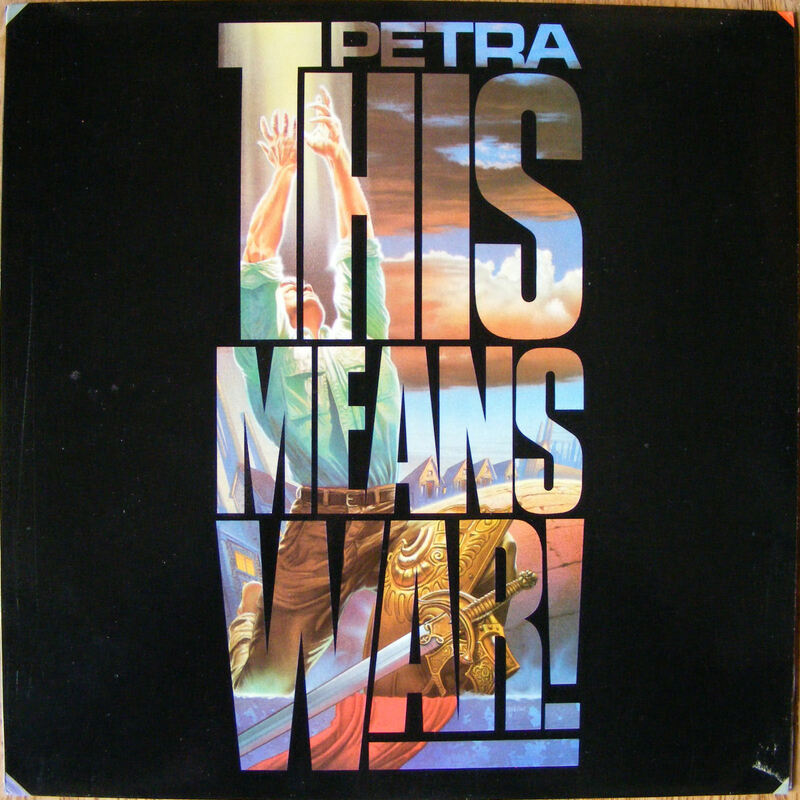 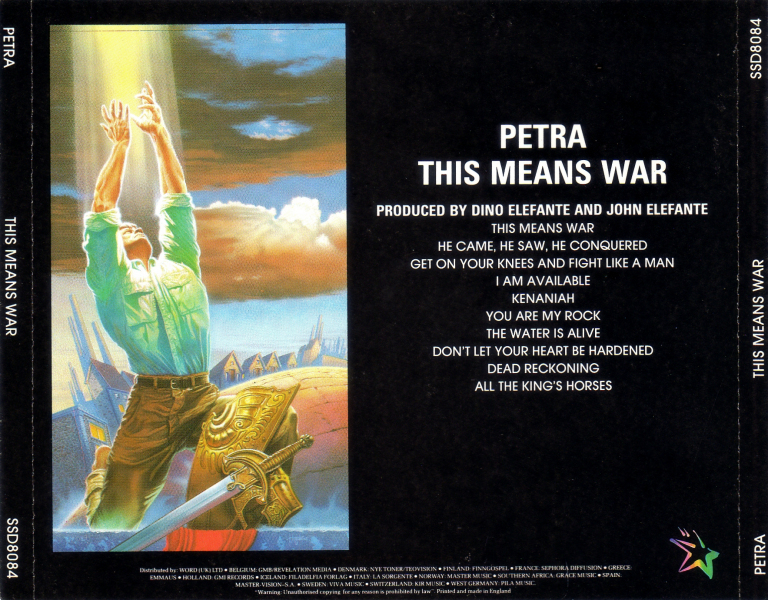 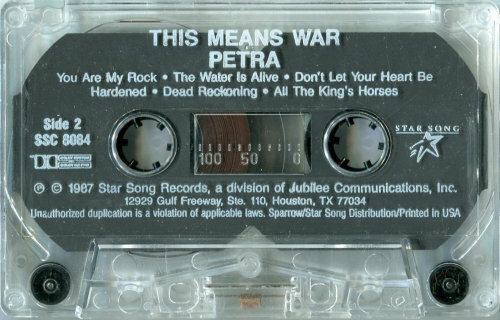 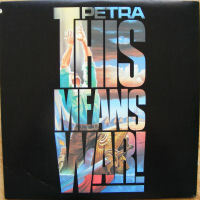 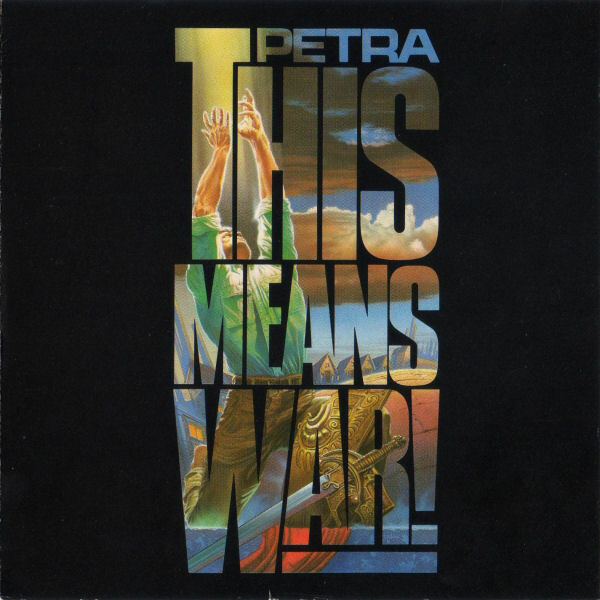 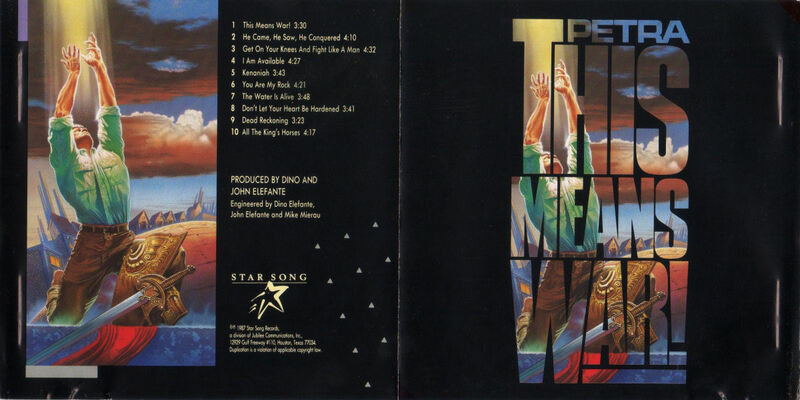 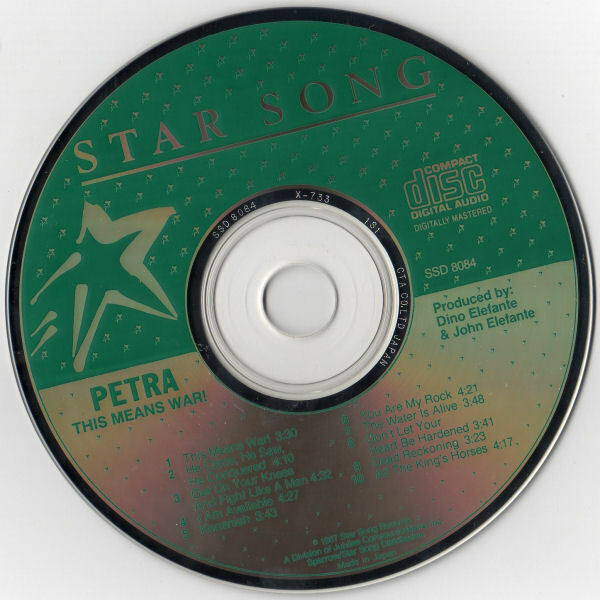 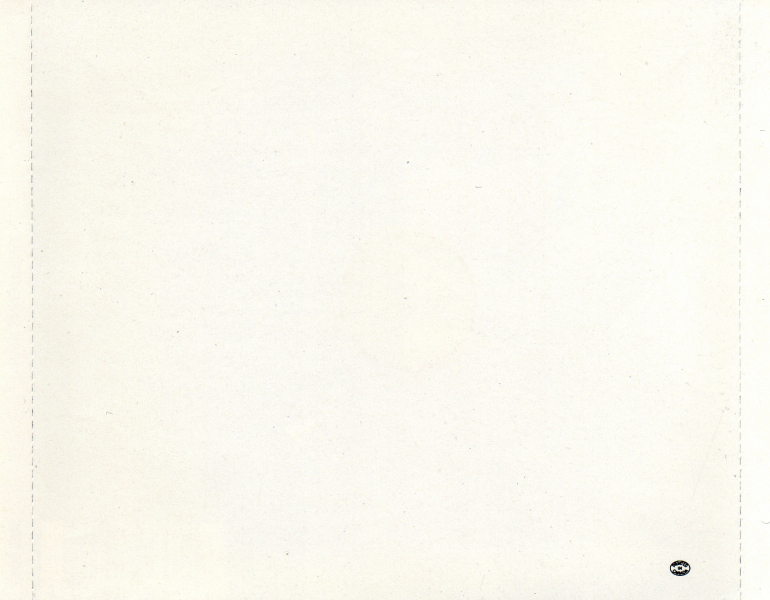 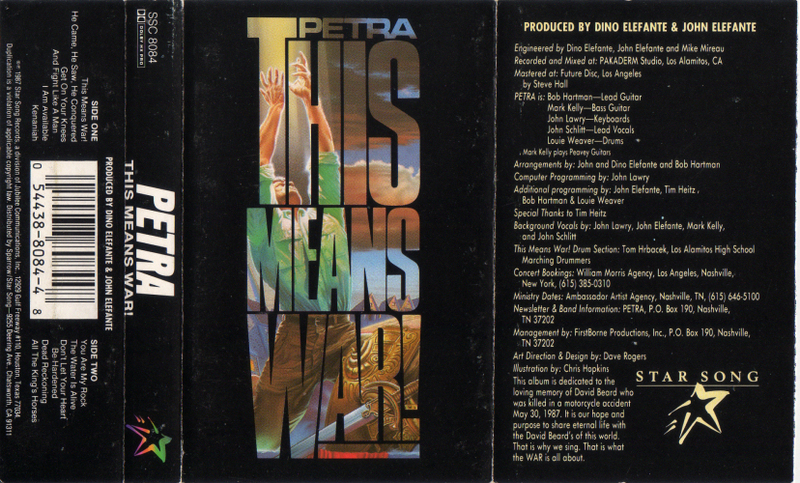 Petraspective - Petra Discography: Albums - THIS MEANS WAR! 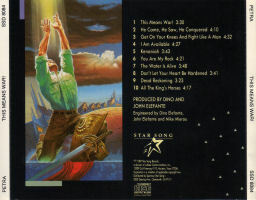 Asylomar Studio (Garden Grove, CA), Bill Baumgart, Bruce Barr & Profound Sound, Coni Elefante, Michelle Elefante, Ernie Ball Strings, Jeff Gallup, Gand Music & Sound, Paul Jackons & FirstBorne staff, L.A.B. 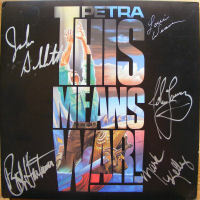 Sound (Garden Grove, CA), David Ludwick, Jerry McAnaulty, Danny McGuffy & Sparrow/Star Song Sales, Len McRae, Mesa Boogie Amps, Music Man, Mike Nelson, Paiste Cymbals - Jeff Newhauser, Peavey Electronics, the families of Petra, Mike Pope and MP Productions Crew, Mark Price, R.I.M.S. 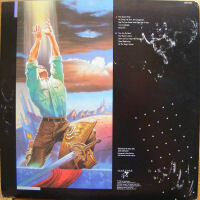 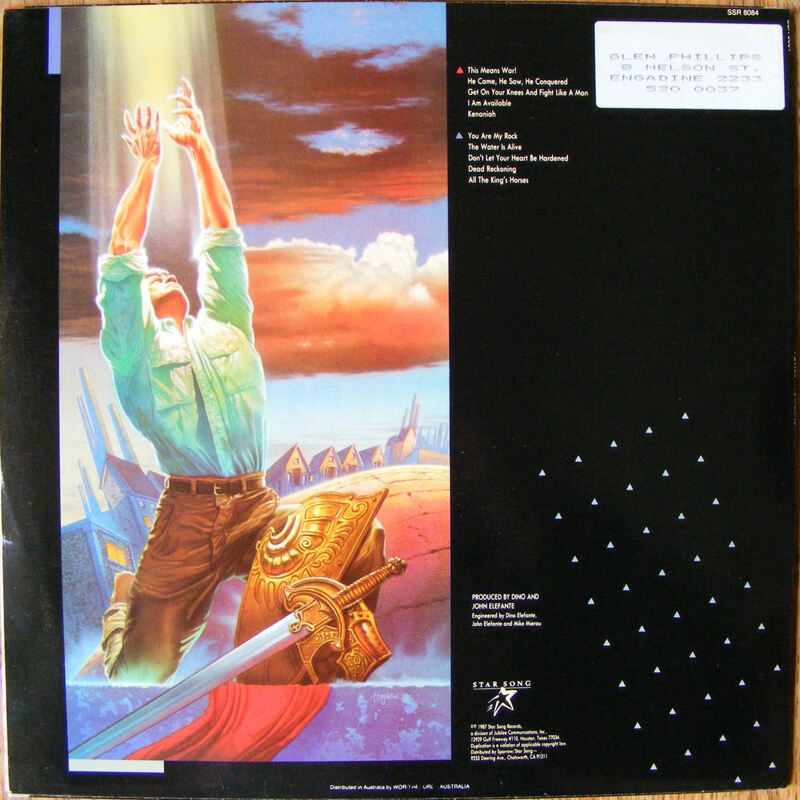 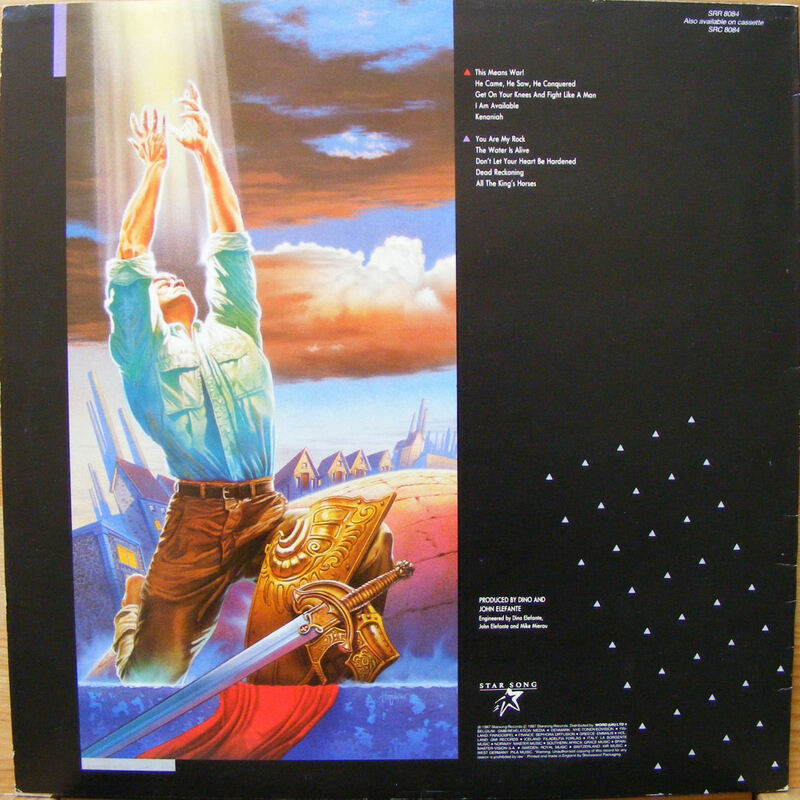 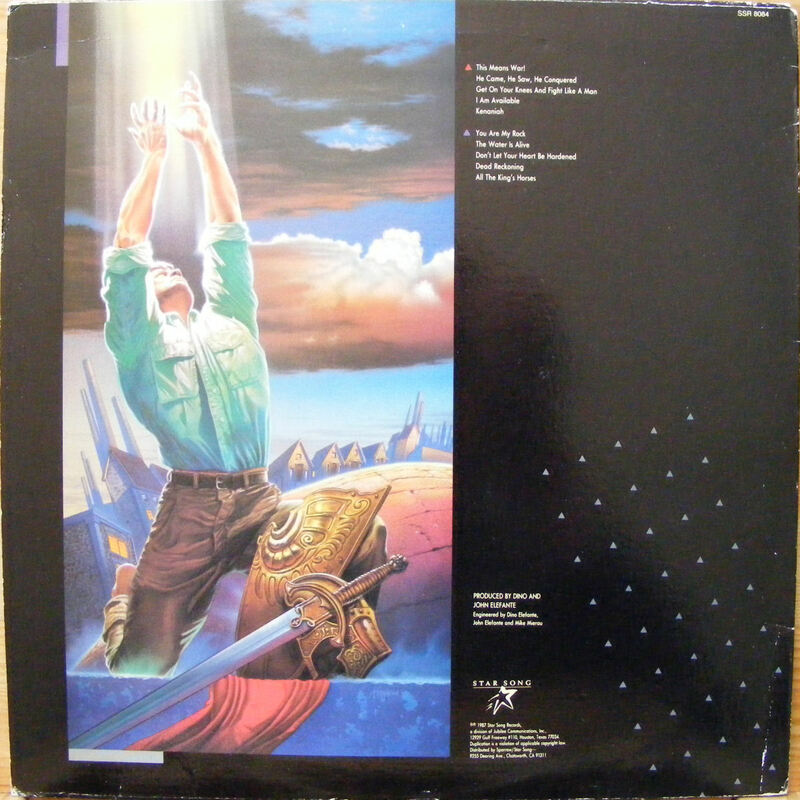 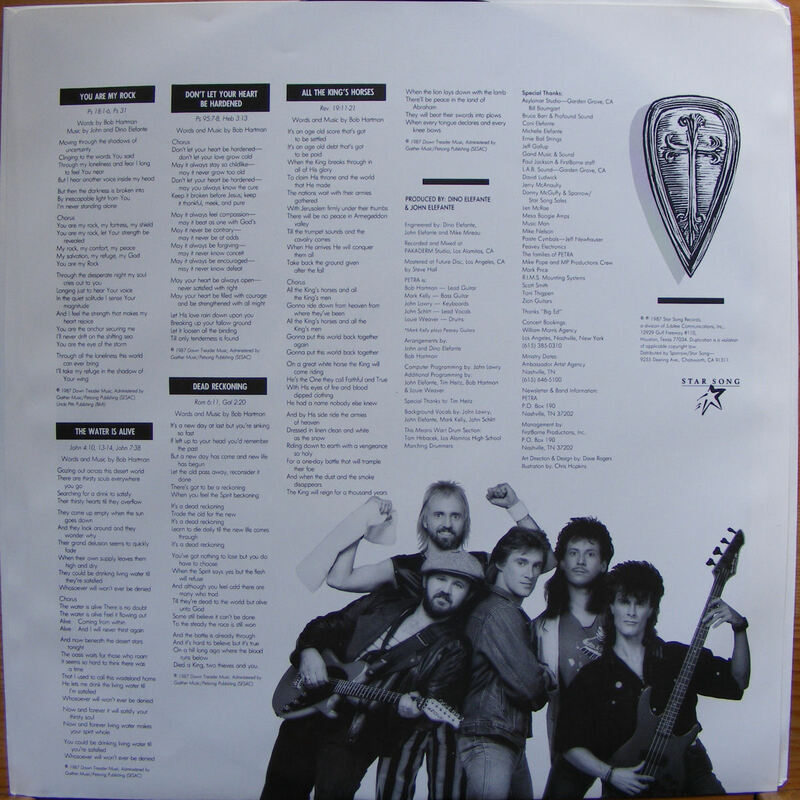 Mounting Systems, Scott Smith, Toni Thigpen, Zion Guitars, Thanks "Big Ed"
This album is dedicated to the loving memory of David Beard who was killed in a motorcycle accident May 30, 1987. It is our hope and purpose to share eternal life with the David Beard's of this world. That is why we sing. 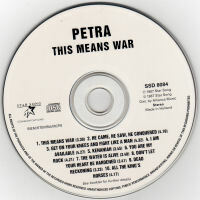 That is what the WAR is all about. 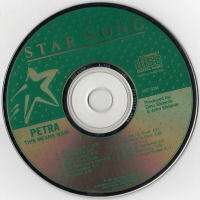 CA Star Song Records ?? US 2 For 1: More Power To Ya / This Means War! 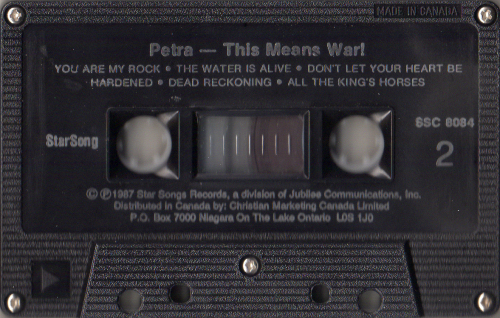 Rock Trax: This Means War! 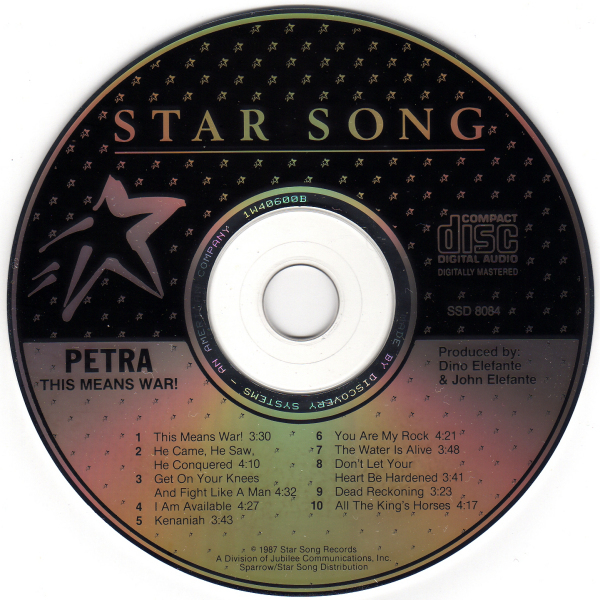 © (p) 1987 Star Song Records, a division of Jubilee Communications, Inc., 12929 Gulf Freeway #110, Houston, TX 77034 | Distributed by Sparrow/Star Song, 9255 Deering Ave., Chatsworth, CA 91311 | Label: Printed in U.S.A.
© (p) 1987 Star Song Records, a division of Jubilee Communications, Inc., 12929 Gulf Freeway #110, Houston, TX 77034 | Distributed by Sparrow/Star Song, 9255 Deering Avenue, Chatsworth, CA 91311 | Printed in U.S.A. 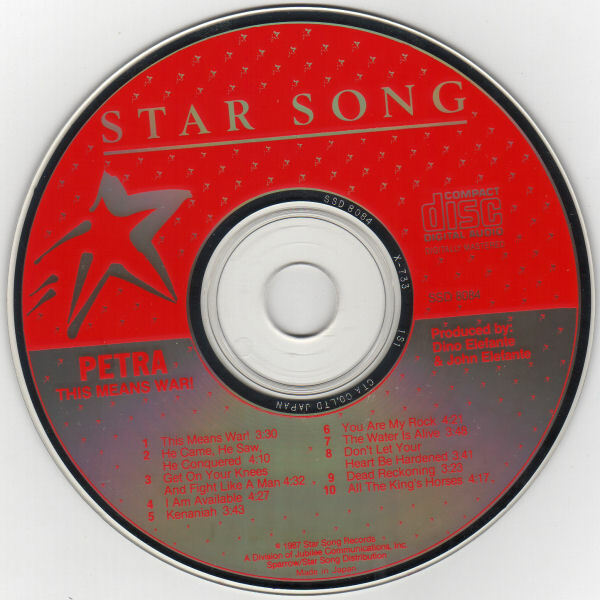 Shell: © (p) Star Song, a division of Star Song Communications, Inc., P.O. 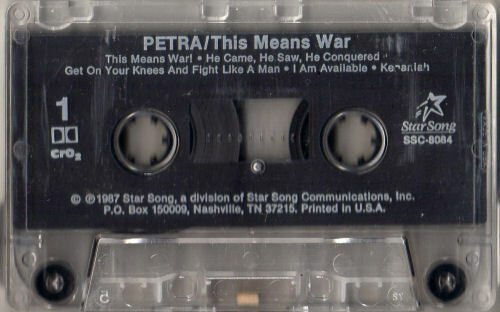 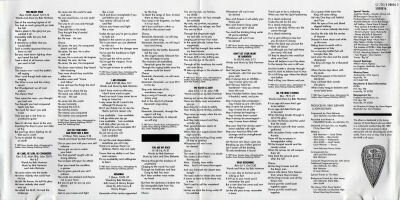 Box 150009, Nashville, TN 37215 | Printed in U.S.A.  Unfortunately, one panel of the j-card was torn off before I owned it. 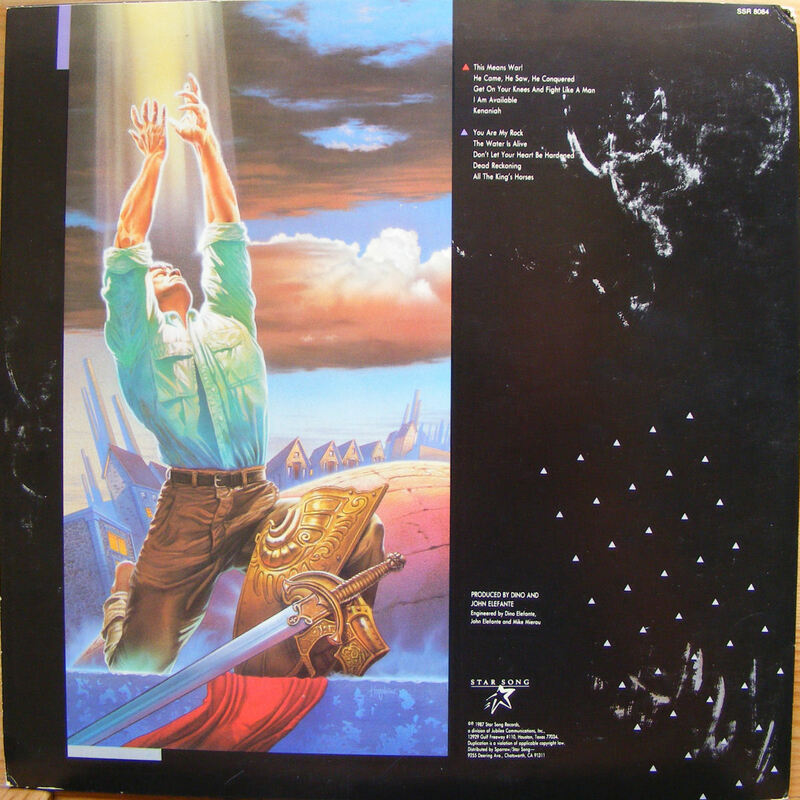 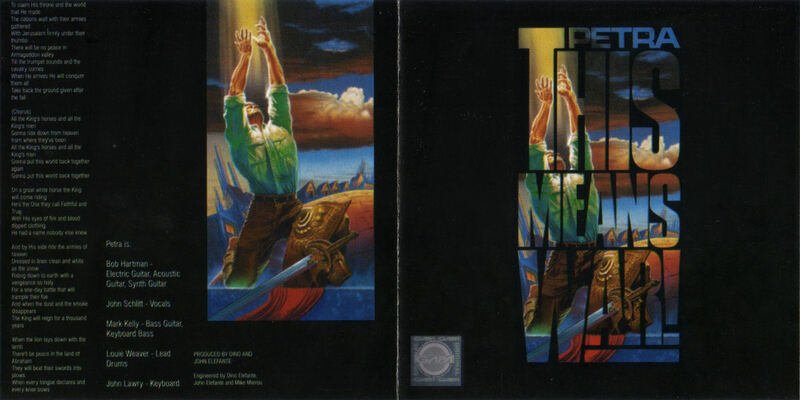 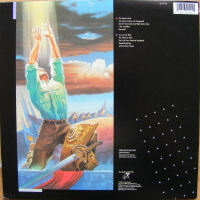 I'm looking for an intact copy. 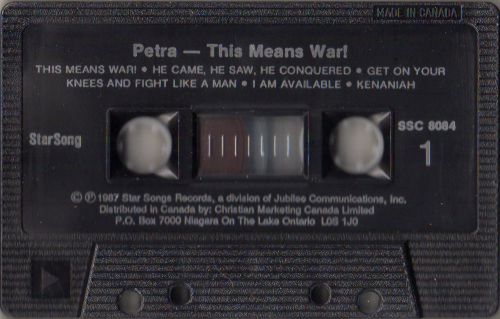 This barcode sticker actually goes with the re-release of On Fire!, so it was misapplied to this version of This Means War! The original barcode under the sticker reads: 0 54438-8084-2 4. 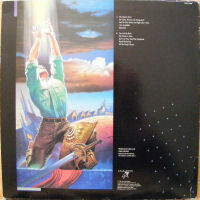 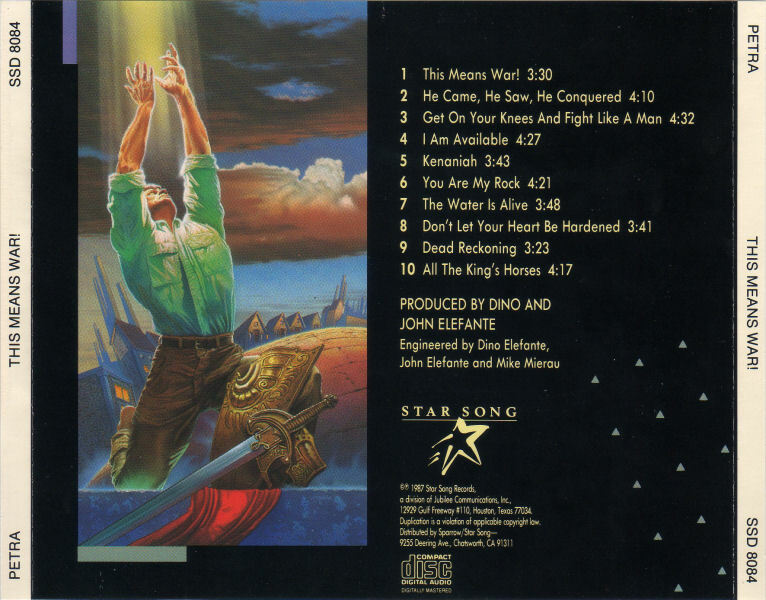 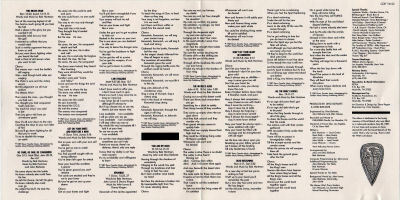 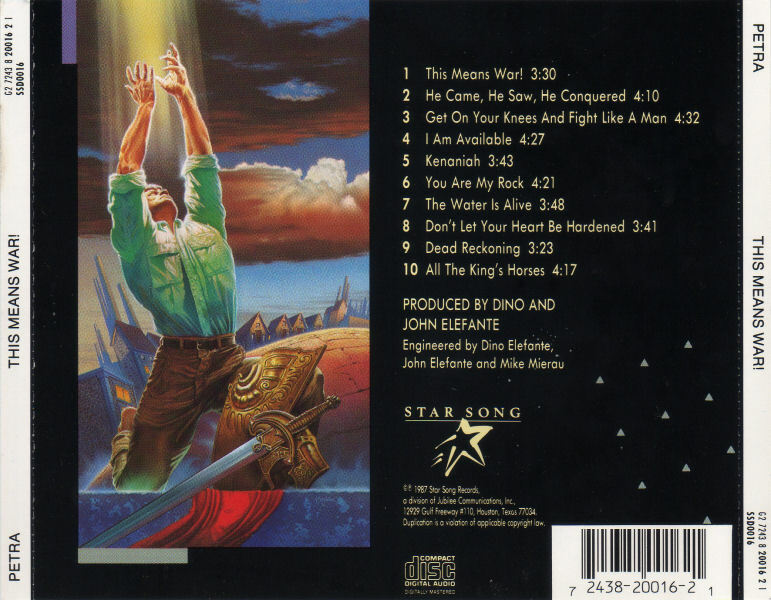 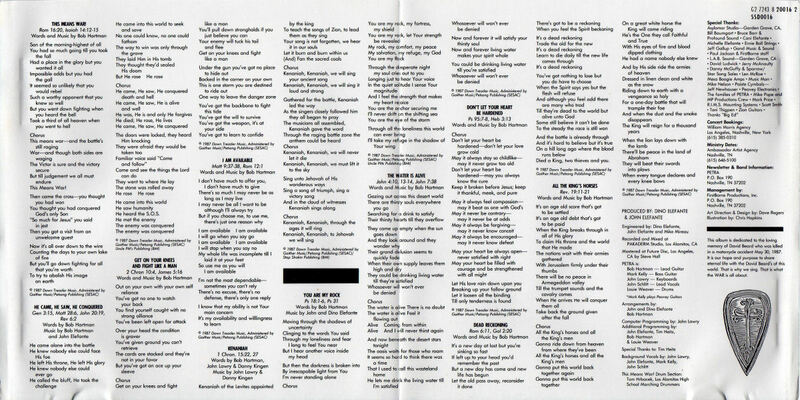 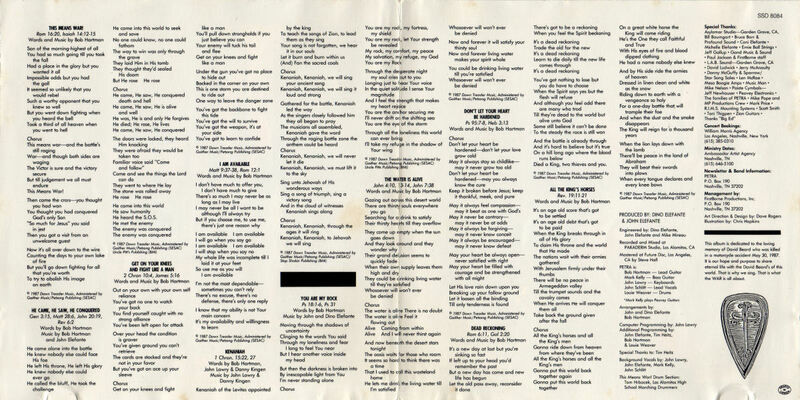 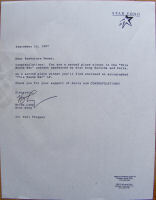 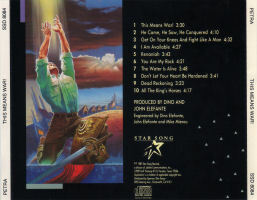 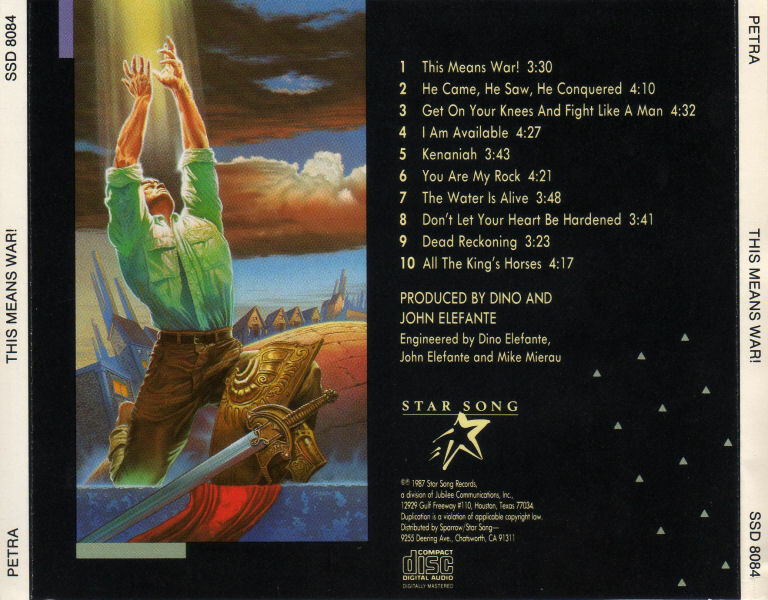 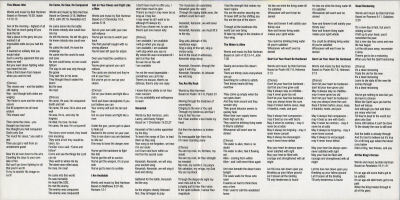 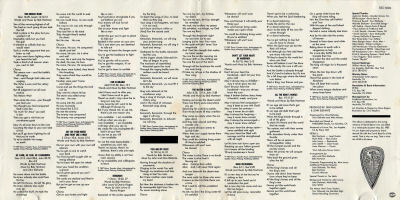 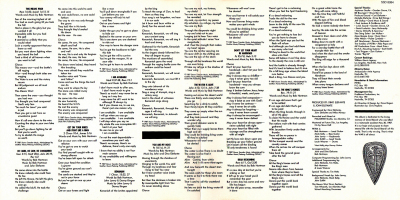 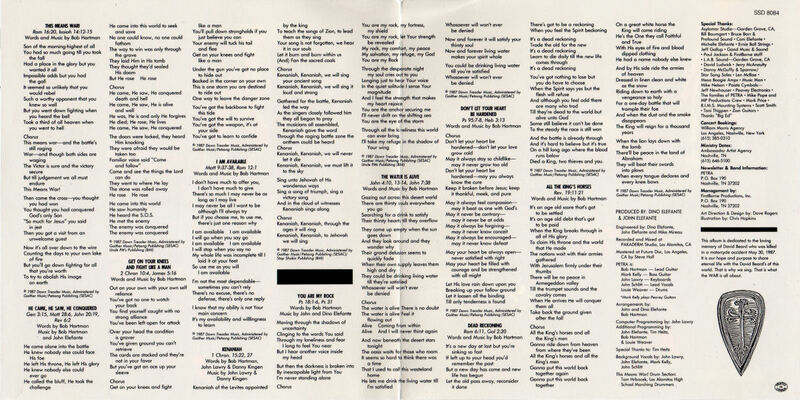 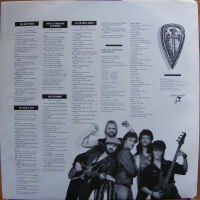 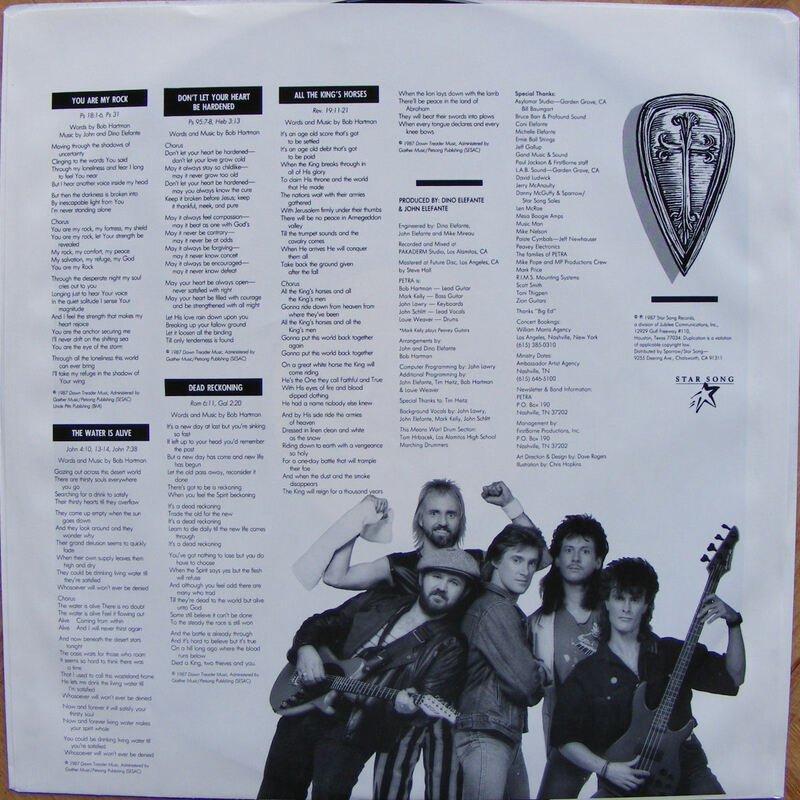 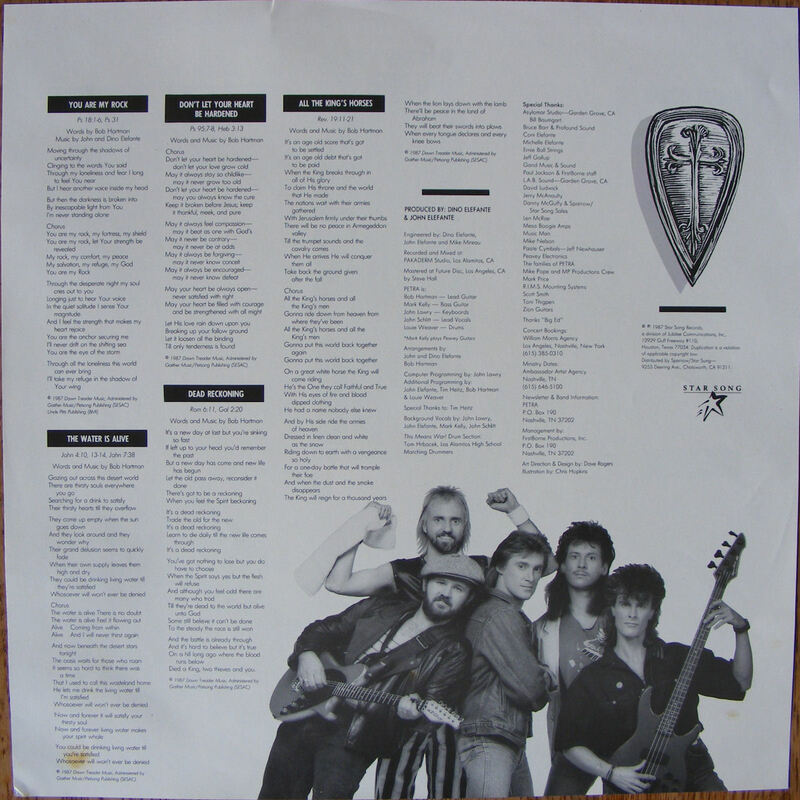 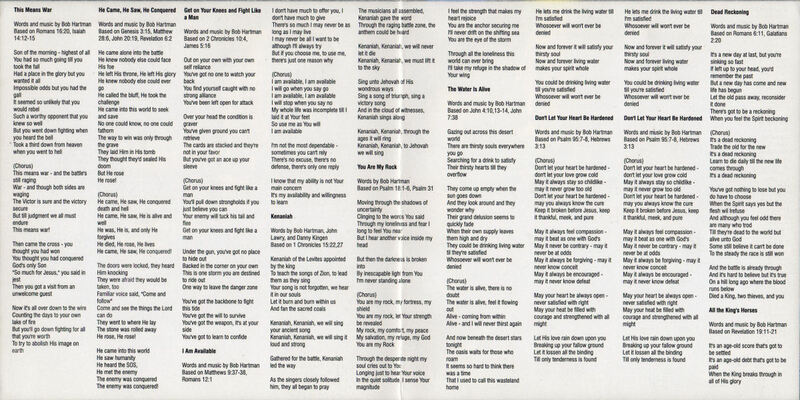 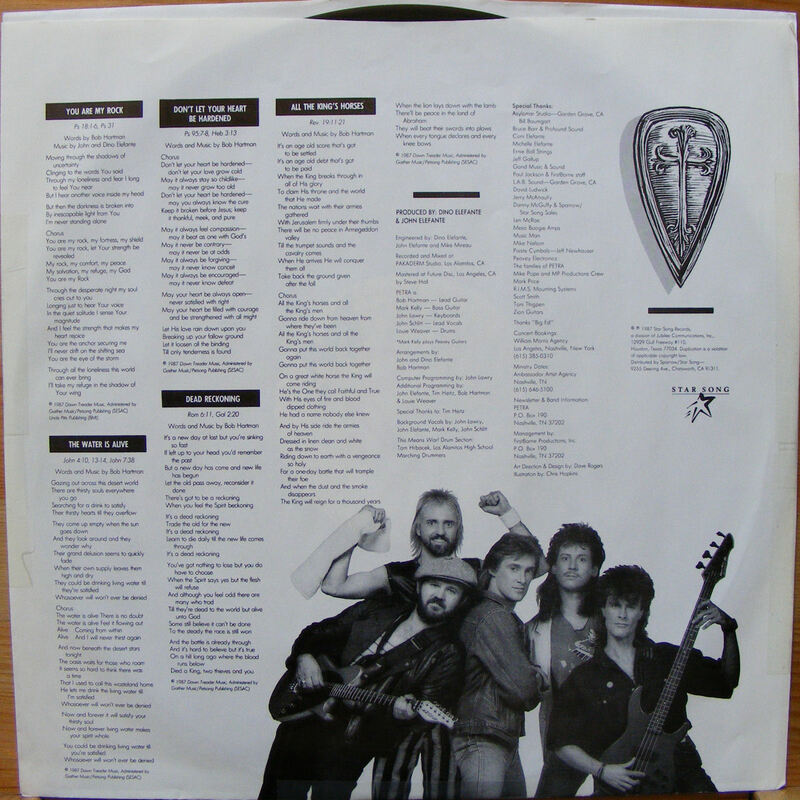 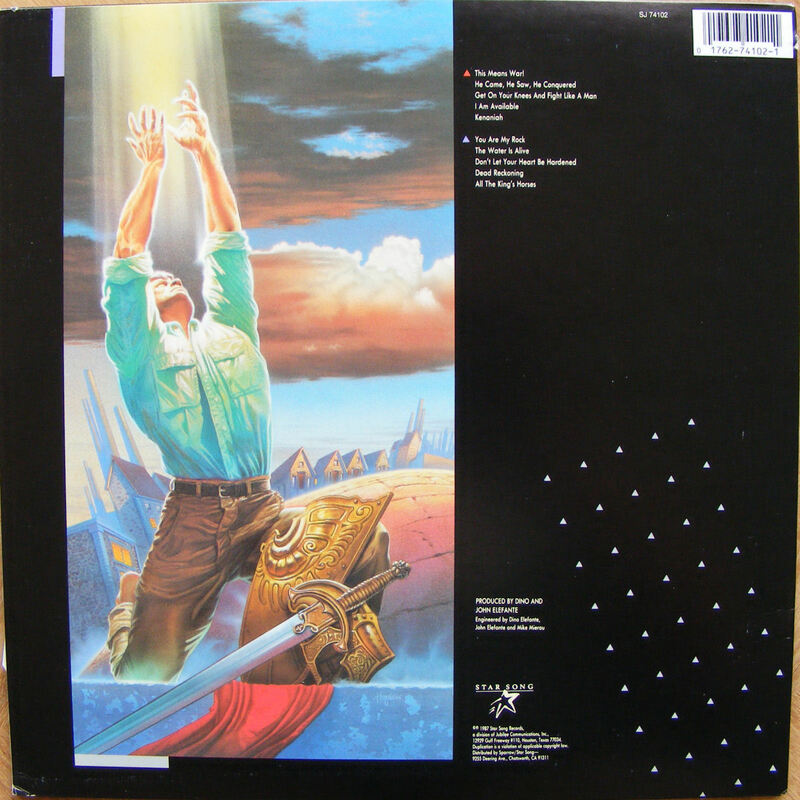 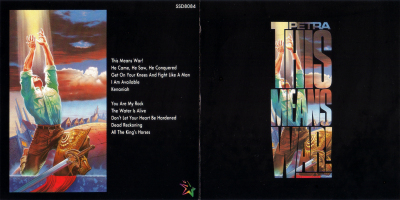 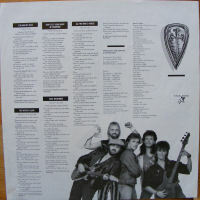 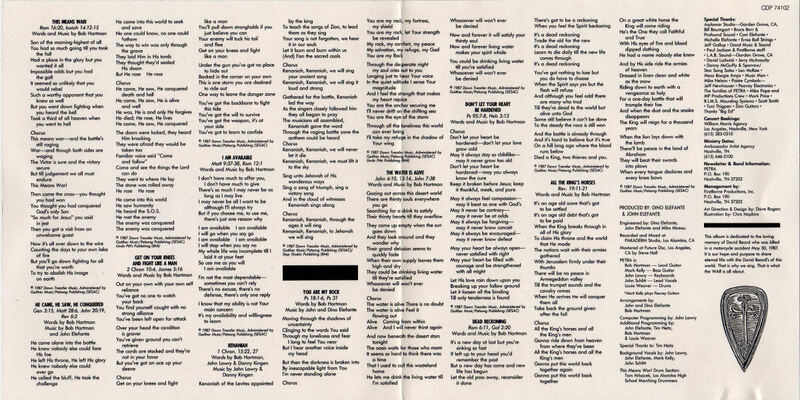  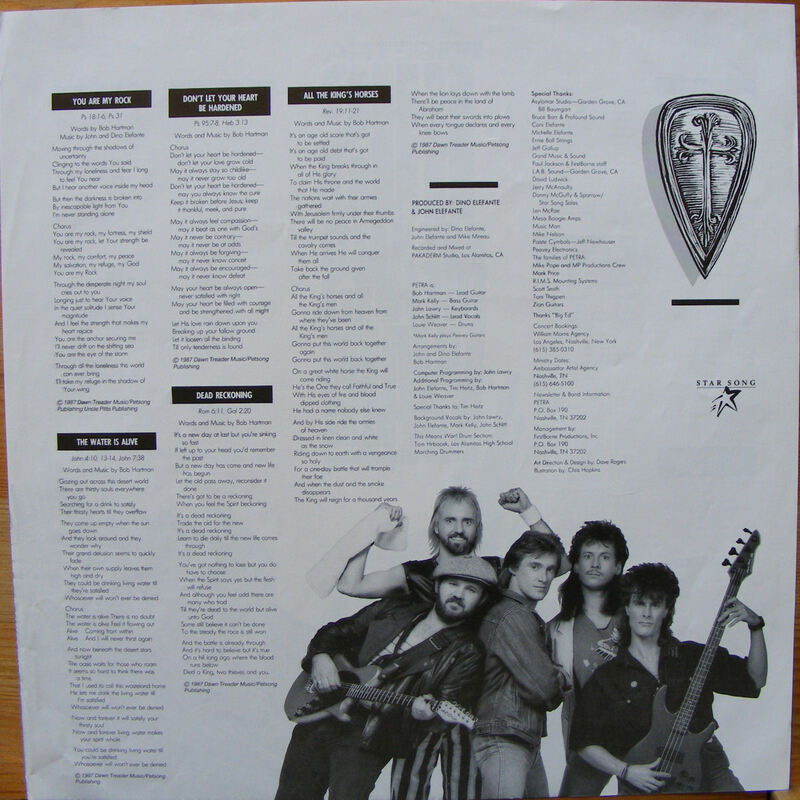 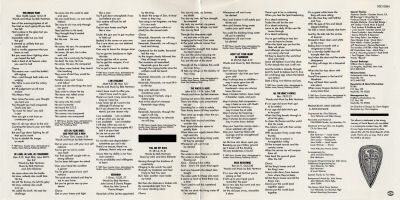 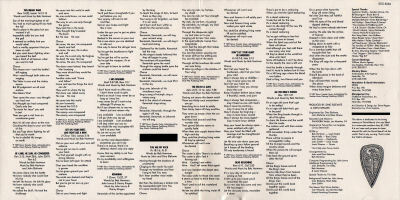 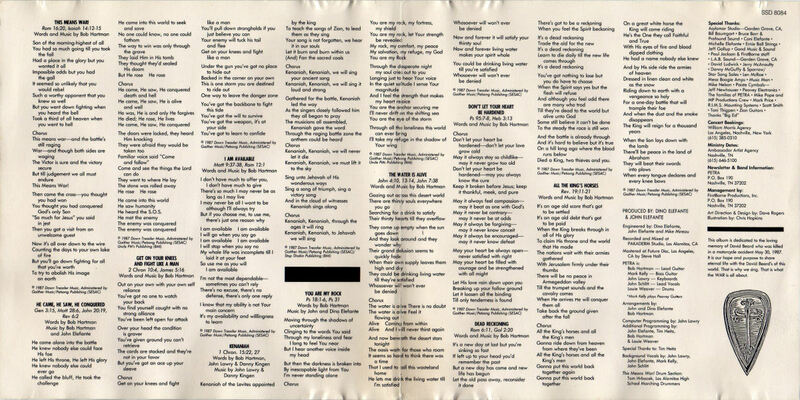 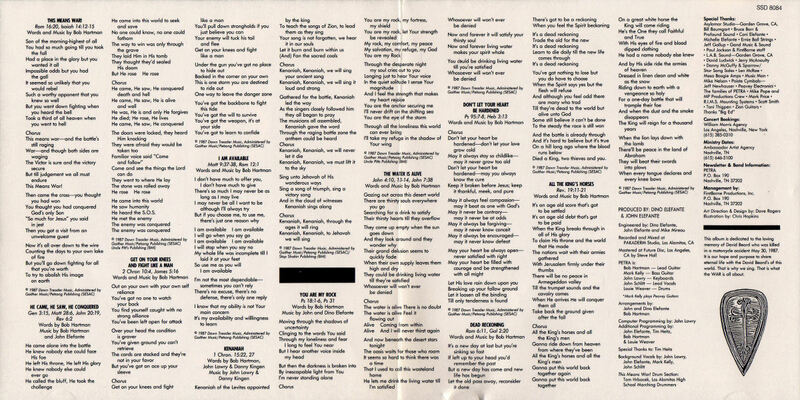 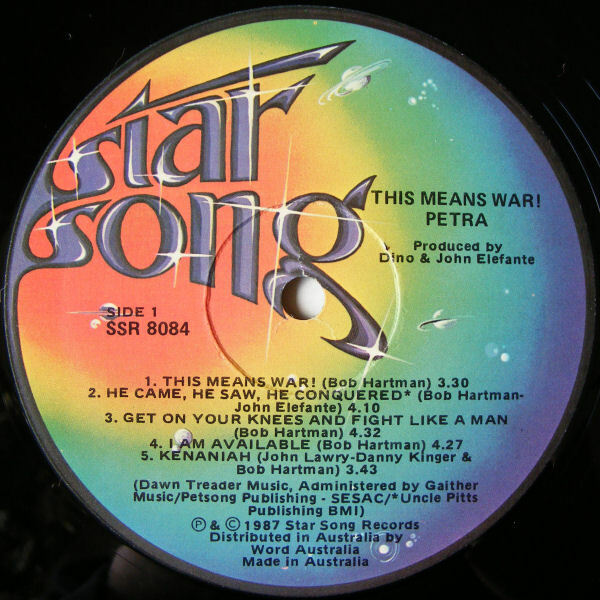 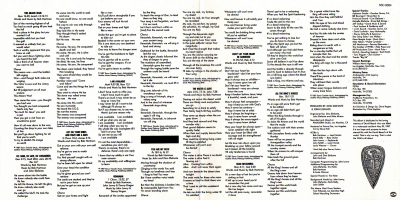 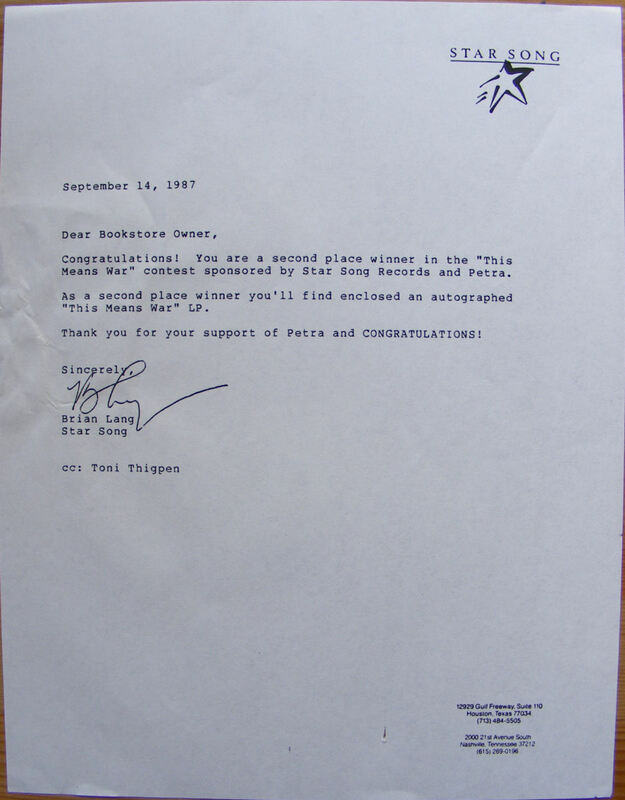 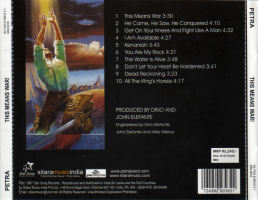 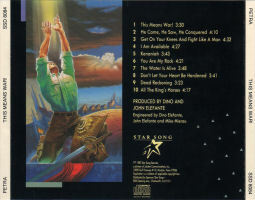 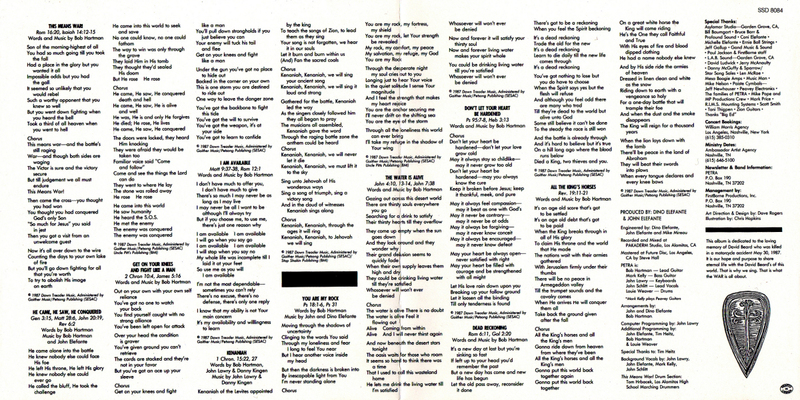 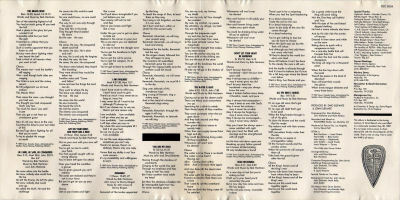 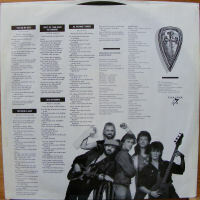 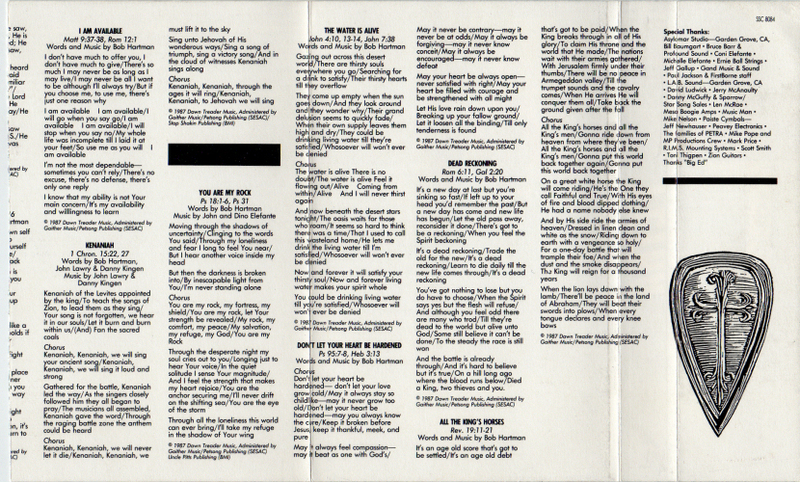 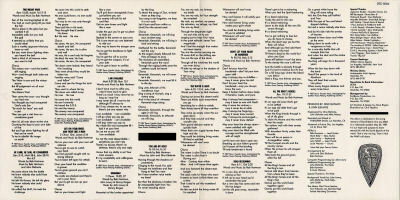 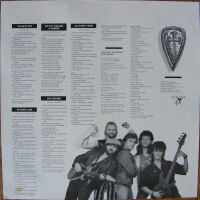 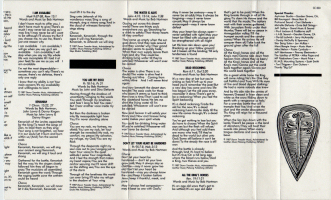 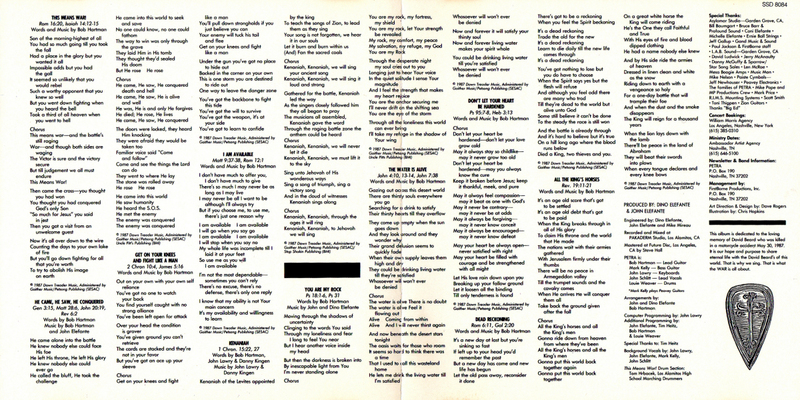 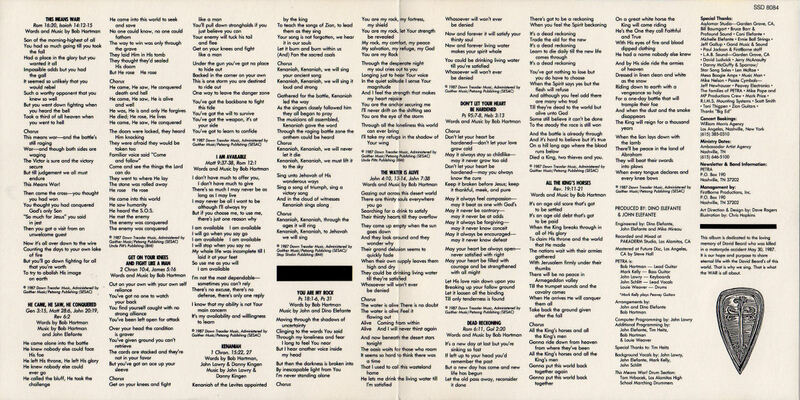 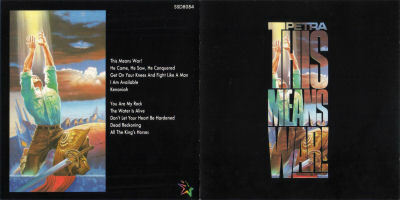 © (p) 1987 Star Song Records, a division of Jubilee Communications, Inc., 12929 Gulf Freeway #110, Houston, TX 77034 | Disc: © 1987 Star Song Records, A Division of Jubilee Communications, Inc.